Horse shows have three main types of competitions 1) performance 2) breeding 3) equitation. In performance, the horses and the riders demonstrate various skills. In breeding, all horses in the event must be of the same breed. They are displayed without saddles. The judges rank the horses on conformation( physical qualities ) and decide which one best represents the breed. In the Equitation competition, the horses are paraded around a ring. They are judged on their riding style and control. Some shows are restricted to only certain breeds whereas others are open to all. The most important show in the U.S include National Horse Show in New York City, the American Royal Horse Show in Kansas City and the Grand National Horse Show in San Francisco, California. In Jumping competitions, the contestants ride across a specially designed course having obstacles for the horses to leap over. The course may include high jumps, wide jumps and two or more jumps set close together. The courses may vary in difficulty, depending on the level of competition. The contestants recieve faults for falls, pushing over part of an obstacle, refusals and other errors. The horse is eliminated from the competition after thre refusals ( the horse doesn't jump over the obstacle ). The competitor with the fewest faults wins. In case of a tie, the competitor with the fastest time wins. The main kinds of jumping include 1) Nation's Cup 2) Puissance 3) Grand Prix. In Nation's Cup, teams from different countries compete. In most cases each team consists of four riders and their horses. The three best score of each team are added to determine the winning team. Puissance consists mainly oh high jumps. Those who finish the course without any faults or with equal faults take part in a jump-off, where the number of obstacles is reduced but the height or width of the remaining are increased. There may several jump-offs, until all except the winner fail to clear the obstacles. Grand Prix competitions are part of the Olympics. All contestants complete the course once, and then the top two or more compete in a jump-off. In dressage competitions the riders guide the horses through a series of movements at the walk, trot, canter using mainly leg and seat signals. The horse's movements should be smooth. precise and graceful, and the riders signals should not be visible. 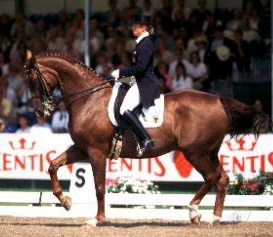 Special dressage movements include the passage, piaffer and pirouette. 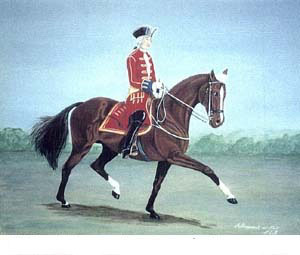 A passage is a rhythmic, elevated trot in which the horse slowly moves forward. A piaffer resembles a trot, but it is performed without any forward, backward or sideward movements. A pirouette is a circle a horse makes by pivoting it's forelegs and one hindleg behind the other hind leg. In competitions the movements must be performed in a specific orders. The scores of each of the many judges are added and contestant with the most points wins. 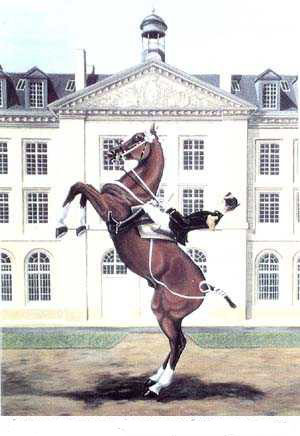 These techniques were developed by military officers who rode horseback. It is often called the Three Day Event because most major competitions take place during a three day period. The contestants first compete in a dressage event and then the Cross Country event. They ride over a course that may be more than 10 miles long and includes a lot of tough terrain. The contestants recieve penalties for refusals, falls and failure to complete in the allotted time. Lastly a stadium jumping competition is held. The results from the three day events are added and the contestant with the fewest penalties is the winner. Eventing is probably the most challenging event. It tests the endurance, obedience, jumping and other abilities of a horse and the skill and daring of the rider.